Sony NWZ-A845 review | What Hi-Fi? 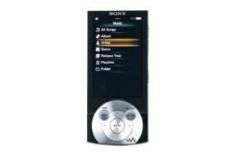 When we first sampled this Sony we knew it was up for a scrap with the iPod nano. “For the first time in years the little Apple has a genuine rival,” we said. And it really is a worthy rival: our review sample came with a list of ways that the company believes its Walkman trumps the iPod. It's a hard list to argue with, too: although there's an admission that the 'A845 doesn't have a video camera, the fact that it has a 2.8in OLED screen and comes with headphones valued at £70 is far more exciting as far as we're concerned. Also very significant is the Walkman's iPlayer support. This is far from the first portable to be compatible with videos from the BBC's online video service, but it is the first that will handle the proper Windows Media Player versions rather than the more compressed ones designed for portables. The result is that crime series Luther is played back with impressive black depth, loads of white punch, and vivid colours. The nano still has the slightly sharper pictures, but the extra size of the Sony's screen is far more important. If we were buying an ultra-portable purely for video, this is the one we'd choose. However, we reckon the vast majority of buyers will be prioritising music, and in this area the nano just edges it. It quickly becomes apparent the headphones are actually a bit of a disappointment, but swap them for a more accomplished pair and the Walkman initially impresses. Play Band of Horses' brilliant Compliments, and although it's clear that the balance isn't exactly neutral, the amount of bass weight and depth is mighty impressive, while the forward-sounding treble manages to just about avoid brightness. What this Sony lacks is just a bit of its great rival's insight and dynamic subtlety. Play The Far Road from Nick Cave's soundtrack to The Road, and the subtleties of the piano and violins are lost, leading to a slightly flat delivery. So, although the Sony's in many ways a more successful video player than the Apple, music-wise it's clearly weaker, and sound quality has to be our priority with ultra-portables such as these.